12-15-16 Today was the big day of Rebecca’s surgery, we walked into this day filled with anxiety and fear but left with relief and hope. It was certainly a scary day for both of us and no matter how many people told us she was in good hands we did not find relief until she was back in ours. Although this post will do little to reduce any anxiety hopefully it will be a good resource and help other moms and dads anticipate what may happen when they get to surgery day. If its any solace the following picture was taken the day after her eight hour surgery. Note: There is a picture of the healing incision so if you are squeamish you my not want to read to the end. 3:30 am – Usually we would struggle to wake up this early in the morning but today was a bit different, as soon as the first alarm sounded we were up and getting dressed. 4:00 am – After a quick cup of coffee we both went upstairs to wake Rebecca. We were not sure what to expect waking her up this early, she was not amused. We put her coat on and left for Children’s Hospital in Boston. We felt terrible because we knew what was coming and she did not, almost as if we were hiding something from her, and it felt awful. I sat in the backseat with her for the ride, and she stayed awake the whole time. She smiled at me and I rubbed her cheek. 5:00 am – We arrived at Children’s Hospital. One of the benefits of arriving early is that we were able to park on the first floor of the garage and it was only a short walk to the front door. We entered the hospital through the emergency entrance at about 5:15 and waited for the main hospital to open. 5:45 am – We went to the 3rd floor which is were Rebecca would have her surgery and after admitting her they lead us to the waiting area. 6:45 am – We were called to the OR recovery room where they started preparing Rebecca for surgery. We went in and Rebecca was weighed, her oxygen levels and her temp were checked. She fell asleep on me while we waited to meet with the surgeon, and I enjoyed every second of it. Before the surgeon, we met with the anesthesiologist and Dr. Fulton her ophthalmologist. Everyone we met was amazing and made us feel very comfortable. Because they were going to perform an Electroretinography or ERG (a test that will check her retinal response by measuring the electrical output of the retina based on a known light source) they needed to cover one of her eyes, something about needing to keep her in the dark before the test was preformed. They added a dilating solution and then patched one of her eyes. They figured she would get upset but of course this little trooper took it in stride, it didn’t phase her, she is such a tough cookie. The last person we met with was the surgeon, Dr. Licamelli. We went over any last minute questions, got a bit more reassurance that everything was going to be OK, and he left to get prepared. This was the third time we met with Dr. Licamelli and each time we felt more and more comfortable with him performing the surgery. He exuded confidence and we needed that more than anything, just another walk in the park for him, and we were grateful for his bedside manner. Even Jake trusted him and that’s saying a lot. 7:30 am – The anesthesiologist came in to get Rebecca. I wanted to bring her into the operating room myself, but where she did not have stranger anxiety they didn’t want me to. They felt it would be too hard on me and so long as Rebecca was not hysterical they preferred to bring her back without us. This was the one time I wished Rebecca was not so brave. We were of course very upset as we kissed her and hugged her before she went off to be operated on. We wondered if she was scared once she realized that we were not around. 7:45 am – We went to the waiting room and grabbed one of three available couches and set up for the day. About a half hour later we could not sit still anymore and decided to head down to the cafe. They have great food and we ended up getting a couple omelets. As we are about finished eating, we got a call that the ERG was done and they had the results. 9:00 am – After the call we rushed back up to the waiting area and we were greeted by Dr. Fulton. Dr. Fulton is a super nice woman and always very nice but leaves things somewhat ambiguous, and she is definitely a difficult person to read. We find ourselves trying to determine days after our appointments with her if the news was good or bad. In this case it was not great. We sat in a consultation room with Dr.Fulton and two nurses. She told us that she was happy to see a response to light, but then said the ERG results showed that Rebecca’s response was 11 micro volts, where most children her age would show a response of 100 micro volts. Jake asked her how that compared to other Usher kids results but she could not say. 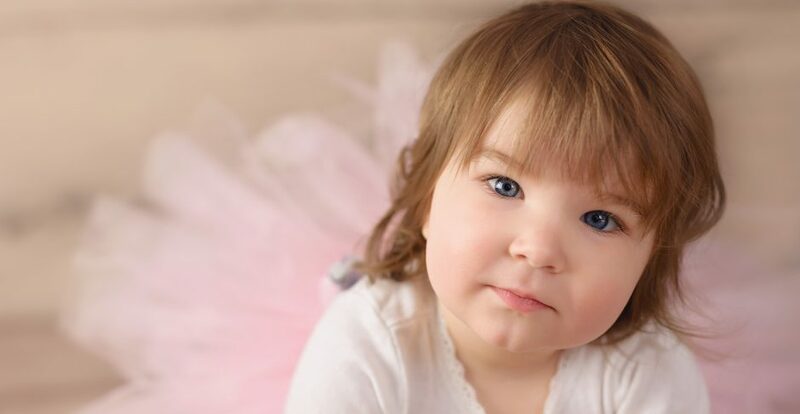 At that moment we realized that Rebecca was one of very few kids diagnosed at this early of an age, and some of the testing being performed was not only for her benefit but also to help them learn more about the progression of the syndrome. As if not bad enough she also said that Rebecca has fluid in her eyes, Cystoid Macular Edema or CME. She didn’t go into too much detail, but from doing a little research of our own, CME effectively blurs and decreases the central vision. This was difficult news to accept as her central vision will be all she has left at some point as the result of her Retinitis Pigmentosa, or I guess in this case, maybe not. I hate this disease… within the hour we decided that we needed to see a specialist and reached out to Dr. Pierce of Mass Eye and Ear. Our first appointment is the 17th of January. 11:30 am – One of the waiting room nurses came out and said that Dr. Licamelli was working on the right side and that the surgery was going well and that we will get an update from the audiologists once they were finished with the first side. We decided that we would try to watch a movie while we waited. The movie was The Magnificent Seven, although a good movie we have yet to finish it. We got about 15 minutes in and could not sit still anymore, so we took a walk downstairs. 12:15 pm – We got a nice visit from Suzy Heikkila and her niece. Suzy was at the hospital after a successful Lego drive delivering the hundreds of donations to children battling Cancer. We were grateful that she visited and she reassured us that her precious Jesse was watching over Rebecca. 12:30 pm – Back upstairs trying to watch more of the movie when the audiologist came out to give an update. She said that they were done with the right side and were preparing Rebecca for the Left side. She said that the implant was tested and there was an electrical response. Although he tried to hide it while she was there, as soon as she left Jake broke down and cried. It was the realization that our baby girl would hear us, that this was really happening, that got to him. We decided to head downstairs again and grab a salad. 2:00 pm – Received another update. Second side was coming along and they will be out to let us know when they are finished. 3:20 pm – By this time we had taken over the waiting room, shoes off shamelessly stealing all the WiFi bandwidth with all of our devices, chairs pulled in for foot rests. All of the sudden Dr. Licamelli and the audiologist came into the waiting room and it felt like all the weight lifted off our shoulders before they could even say anything. We rearranged the furniture and they sat down, “everything went great”, Dr. Licameli said!! They sat with us for a bit and discussed the surgery and told us that both implants were working 100% which was a huge relief. There was a small tear in the ear canal but nothing to be concerned about. 3:45 pm – We were finally on our way to see her! The walk to recovery was a long one and when we got there Rebecca was in the arms of one of the nurses with her eyes partially opened, and a princess Leia looking bandage on her head. I snatched her right up and held her as close as I possibly could. She was in and out of consciousness and did not seem comfortable at all. We asked the nurse to give her something to help her with the pain, and she gave her morphine. As they were giving her the medicine I was able to nurse her. It was around this age that Reagan stopped nursing and I wanted nothing more to last at least until her surgery day, and I was so happy that I was able to nurse her that day so that I could comfort her. 5:00 pm – After giving her her medication and preparing a room for us they moved us to the unit next door (Mandel 3) it worked out perfect as it was a private room that both Jake and I could stay in together. 8:00 pm – Rebecca was still a bit out of it but already getting back to her old routine of bed at 8:00 so I nursed her again and she went to sleep. Because the nurse had to give her medication every couple of hours, Rebecca would wake up and Jake and I comforted her until she fell back to sleep. old self again. She was doing amazing, still a bit out of it but she was eating and drinking and annoyed with all of the equipment attached to her. 9:45 am – She was now playing and laughing at us and the equipment was starting to come off. The nurse was great with her, he knew a bit of sign language and was signing with her and she was eating it up. He told us that we would be out of there in the next couple of hours, so long as we were OK with taking off the bandages. was over. I just wanted to get her home and comfortable. After a flat tire and a quick tire change we were home by 1:00 pm. 2:00 pm – We removed the bandages expecting to be upset over the incisions but surprisingly they looked great, she had some swelling near the implant site and on her forehead but that started to go away quickly. We were super impressed with the skill of the surgical team! Its now Monday 12/19 and things are mostly back to normal, short of some antibiotics, motrin, and neosporin on the incisions. Rebecca is recovering nicely. One of the things that the surgeon warned us about was a setback with her balance seeing as she already had vestibular issues, and she had worked so hard to get to where she was so this concerned us a bit. To our relief however, not only did Rebecca not have any setbacks, she actually figured out how to crawl less than two days after her surgery, something she had never done before. We will forever be in debt to the staff at Children’s Hospital, the surgical team led by Dr. Licamelli, and especially our family and friends that offered their support over the past few days with countless messages of encouragement and hope. We are so relieved that the surgery is behind us, Rebecca is doing amazing, and now we can look forward to Activation Day on January 10th!! I am so happy that things went smoothly. You have all be in my thoughts and prayers and will continue to be. Glad things went so well! I knew the day I met you it was for a reason… you and your husband are so strong. I think of you often and pray for your daughter who is truly blessed to have you both as her parents!!! Keep fighting the fight!! Thank you so much Lenora!